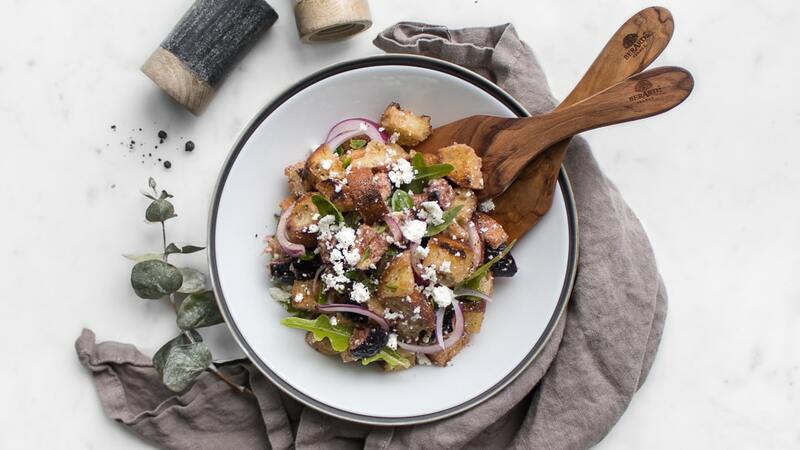 Sweet figs and a healthy sprinkling of mildly sweet ricotta cheese, makes our fig panzanella a summer staple perfect for picnics and backyard entertaining. Panzanella, the beloved bread salad of Tuscany captures the freshness of summer and is traditionally made with ripe tomatoes, oil, vinegar and onions. Changing its basic foundation, the swap of tomatoes for figs and a healthy sprinkling of mildly sweet ricotta cheese, makes our fig panzanella a summer staple perfect for picnics and backyard entertaining. What’s most satisfying is the promise of each bite; crunch from the bread, sweetness from the figs and red onion, aromatics from the basil, spiciness from the arugula, tanginess from the dressing and airy ricotta. What can we say, stale bread never tasted nor looked so good. Cut your day-old loaf into ½ inch cubes and coat with a few tablespoons of olive oil. Toast the bread in a skillet until each side is golden brown, adding olive oil as necessary. Place toasted bread in a serving bowl and set aside. 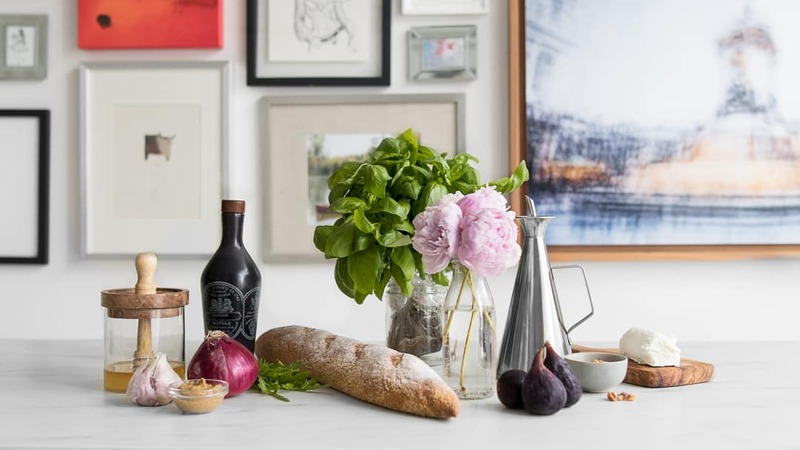 Slice a red onion with the grain, slice your figs into small chunks and place in the bowl with the bread. Combine 1/3 cup olive oil, dijon mustard, honey, vinegar, salt, and black pepper and whisk until combined. Pour 2 tablespoons of the dressing over top the bread, onions and figs and allow to marinate for at least 20 minutes in the refrigerator. Right before serving, add the arugula, basil and ricotta cheese to your bread, onion and fig mixture. Be sure to toss gently as the figs, arugula and basil are delicate. Once fully mixed add in the remaining dressing, a quick stir and serve. Great salad. The flavors work so well together. The figs really shine.